With a market share of only 20 percent, the notorious Cupertino-based company managed to grab most of the smartphone operating profits worldwide. The iPhone 6 and iPhone 6 Plus may not have been able to put Apple in control of more than a quarter of the global smartphone market, but the situation is completely different when talking about operating profits. While handsets powered by the Google Android mobile OS clearly dominate the market, the manufacturers of these devices have to deal with very low profits. On the other hand, Apple managed to grab impressive profits with a market share of about 20 percent. 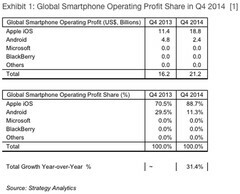 According to Strategy Analytics quoted by ZDNet, the entire smartphone industry had a profit of $21 billion during Q4 2014 and Apple scored no less than $18.8 billion. This means the company behind the iPhone had 89 percent of the worldwide profits generated by smartphone sales, although they only sold 20 percent. 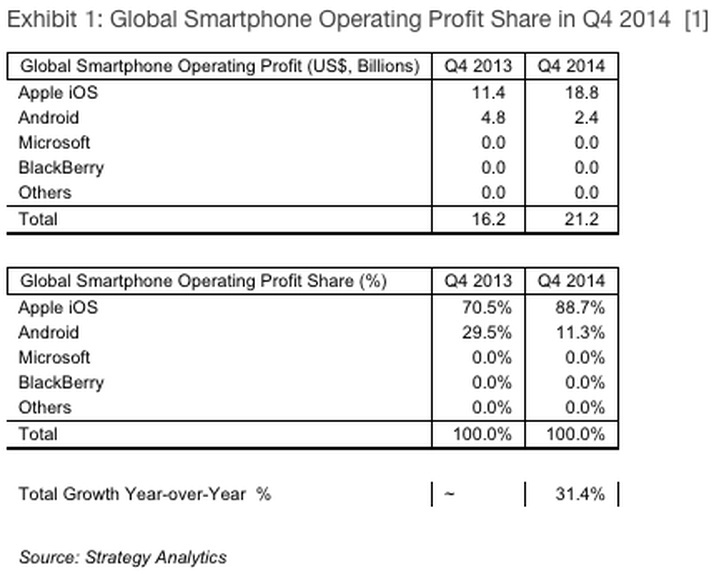 Android profits dropped 50 percent when compared to Q4 2013 - from $4.8 billion to just $2.4 billion. Neil Mawston, executive director of Strategy Analytics, said "Samsung was the main downward driver of Android profits worldwide in Q4 2014" and that major manufacturers that fail to grab "decent profits" from Google's platform "may be tempted in the future to look at alternative platforms such as Microsoft, Tizen, or Firefox."